One of the most anticipated movies of 2017 is Disney’s live-action version of Beauty and the Beast. We both remember seeing the animated version of Beauty and the Beast in the theater when we were young. After watching the trailers, we were in awe. While we anxiously awaited the release of the film, we decided to get cooking in the kitchen. So we are inviting you to “be our guest” and try our newest recipe, Enchanted Rose Creme Brulee. The new version of the movie features one of our favorite actresses, Emma Watson. We are huge Harry Potter fans. Therefore, seeing the actress who we’ve come to know as Hermione Granger portray the Disney Princess who loves to read is beyond perfection. Casting aside, the movie looks absolutely stunning and we are so excited to see it! As with most recipes, our Enchanted Rose Creme Brulee was inspired not only by the location but also elements of the movie. With the French theme and the huge dinner party performance of Be Our Guest, Creme Brulee was a no brainer. To add theming to our recipe we decided to focus on the Enchanted Rose. It plays such a huge part in the story. We feel we should give a warning about using Rose Water in recipes. A little goes a long way. While the amount we use may not seem like a lot it really is! Don’t add more or you’ll turn your dessert into a perfume bottle. 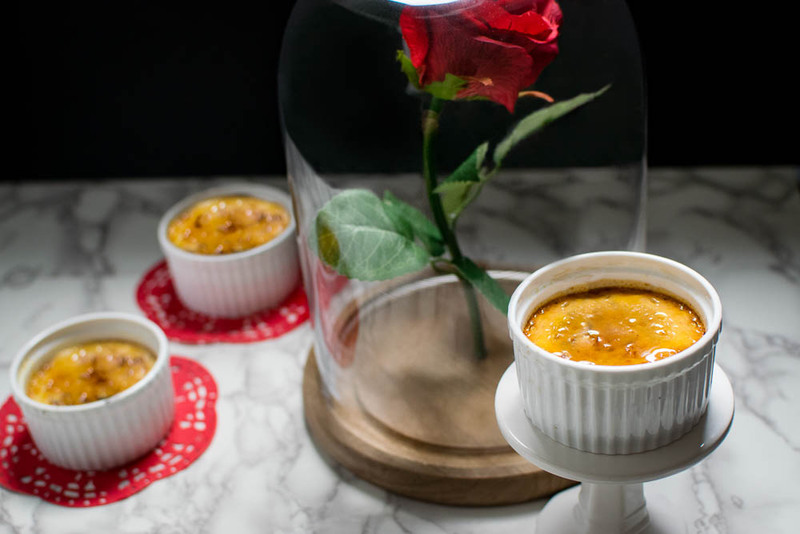 We hope you enjoy our Enchanted Rose Creme Brulee recipe as much as we enjoyed making it! Are you excited to see Beauty and the Beast? What was your favorite part of the original? Leave your comments below or use the hash tag #GeekEats! Place 4 ramekins into large baking pan. Pour mixture into the ramekins. Fill baking pan with boiling water up to the middle of ramekins. Place baking pan in oven (be careful not to slosh water into your creme brulees) and cook for 40 minutes. Let custards cool, and refrigerate for a few hours. Remove from fridge and top each custard with 1 tbsp sugar. Oh my gosh this is such a cute idea! It makes me wish I could cook. I love how cute the picture with the rose is, too! This looks like a yummy thing to do. I have to pass it on to the hubby and see if he can make it. He loves cooking/baking. Thanks for sharing this. I’m such a fan of Disney inspired recipes. This is perfect! This is such a cool idea and look yummy! This looks so delicious! I will add this to my “to try” recipe list! I’m a huge fan of Beauty and The Beast! This creme brulee recipe looks amazing. Love Beauty and the Beast! What a great recipe inspired b the movie, I bet it’s delicious. Yum! I am going to have to make this tonight, you inspired me!